It was at the request of the POWs themselves, and with their help and encouragement, that this book was written. It is the story of 500 men, from all three services, mostly unknown to each other, who had been captured in Sumatra a month after the fall of Singapore. It is based on the secret diary kept by Captain Dudley Apthorp, their commanding officer, at great risk to himself, and carried from camp to camp in a hollowed out bamboo. It also includes the recollections in their own words, of several of the POWs. They travelled further than any other group and were the only unit to work from the Burma end of the infamous Railway. 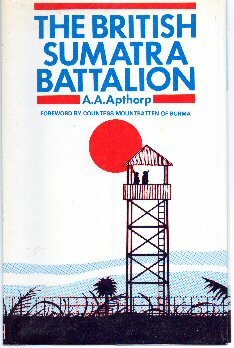 The British Sumatra Battalion had no official existence. It came into being due to the remarkable qualities of the men and their commanding officer, and in time was transformed into a unit with the esprit de corps of an old established regiment. The nominal Roll and details of casualities are included.